Arriving to Nha Trang city from the airport is not difficult. Some people come by bus or train, but most of the foreign tourists arrive by plane. The bus and the train have the same price. Read more about train and bus in Vietnam.There are 2 airports, but the old one, which is close to the city, was closed for tourists in May 2004. The new airport Cam Ranh is located 35km south of Nha Trang. It takes 45 min by taxi to the centre of Nha Trang. It costs around 170,000 VND (US$10). A cheaper option is a bus, 26,000 VND (1.8 US$) to the old airport and from there you can walk around 800m to the nearest hotels or pay another ticket and the bus goes further to the major hotels in the Nha Trang . Read more about Nha Trang airports. How to use a taxi in Nha Trang? Having some experience with Vietnamese taxi is very useful to save your money, but if you are arriving to Nha Trang as your first destination in Vietnam, here are some important things to remember. If you decide to travel in Nha Trang by taxi, make sure they have information written on the car that they use meter. Make sure the meter is 0 when you get in. Sometimes they will continue counting after the previous passanger. Even when they use meter they can still cheat you. Once I took a metered taxi from in front of a hotel. At my destination the meter showed 48,000 VND but to be polite I asked the driver How much? He happily said 100,000 VND. So I pointed with my finger the meter and asked What's that? Then he asked me with amazing smile on his face Ah, so you want to pay the meter price? Hahaha those people are really funny. Make sure you look carrefully how much you have to pay. It also happened to me another time that the meter was showing 35,000 VND, but the driver asked for 190,000 VND. He was showing me different numbers on his meter, but the only price I saw was 35,000. Well, even though I didn't win. The driver was shouting and kept my luggage until I payed 190,000 VND. It happened because it was a taxi from a small company, maybe also not a genuine one. One of the biggest company in Vietnam is Mai Linh taxi. They have nice cars and always use meters. To be more safe take a taxi from a big company. You can buy a ticket online, but sometimes it is cheaper to go to one of many tourist offices and buy from them. Also it is cheaper to book a taxi there or ask your hotel to do it. Otherwise there is always a possibility that the driver will cheat you. If you book from a tourist office you pay a fixed price and get a receipt. When the taxi comes to pick you up, just give your receipt to the driver. Sometimes they let the meter run anyway, then you can see how much it would cost you without fixed price. The price is double. So a prepaied taxi is the best solution. If you are arriving to Nha Trang for the first time, you may not understand what people on motorbikes want from you. Many men will stop on the street and shout "Hello motorbike". When I heard it for the first time, I really had no idea what they wanted. Because a taxi in Nha Trang is still not very popular, many men use their motorbike to pick up tourists and bring them to their destination. If you decide to take such motorbike-taxi make sure you agree the price before the journey. The drivers always do everything to earn as much as possible. It is the same problem with cyclos. There are plenty of them in the centre and just wait for any white person to appear. 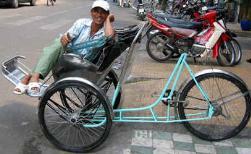 Then they will shout and wave their hands to persuade you to use the cyclo. Funny thing happenes when you ignore those motorbike shouting men. If you stay more then few days in Nha Tang you will really have enough of those men following you. If you just ignore them somehow they start thinking that you are blind and deaf and they will follow you shouting even louder and wave their hands as much as possible. Read my story what happened when I ignored a motorbike man. After arriving to Nha Trang you will notice that the city streets consists mainly of motorrbikes. Ant this is the way most people travel around the city. You can rent a bicycle or motorbike, but be worned that there are no rules on the streets. They have never ever heard of giving the priority to pedestrians. They just seem to be blind to anyone crossing the street. They will drive just stright on you. They turn whenever they like and they stop wherever they want. So in my opinion it is better for tourists to walk or take a taxi, than renting a bicycle or motorbike. Be warn also that bicycles have absolutely no lights so in the night you actually don't see them on the street. When you cross the street you can notice a bibycle when it is just 2 or 3 meters from you. It is really dangerous and for me personally those bicycles appearing from the darkness looked almost like ghosts appearing out of nowhere. Very scary experience.